I plan on getting a new canoe before spring. 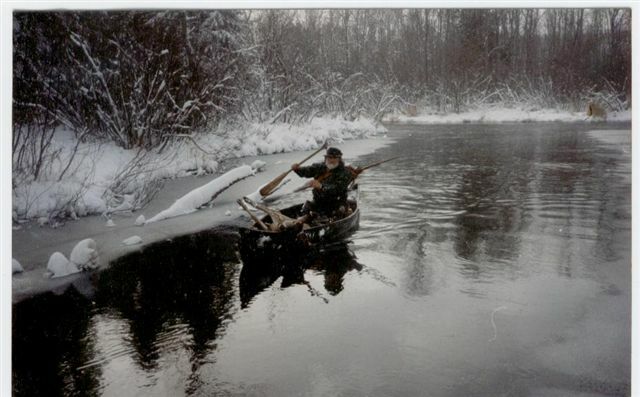 The only canoe I ever owned was an old 17ft coleman when I was young,and they are not made anymore. I want to go on some overnights on the Alleghany , Yough, and other local rivers. I cannot afford a homemade birch, or birch replica at this time. Any suggestions? The Old Town Saranac is on sale and looks decent. What is the difference between it and the Guide model? For fishing, hunting, and camping which is the best choice? I am open to any manufacturer, was hoping to keep it around the 500 dollar range. I am just hoping someone's experience will help me pick out the best one. I'm not super into canoes, but my boss is well beyond being called a canoe-nut. He has ones for lakes, ones for rivers, and ones for whitewater. He has bounced all sorts of information off of me about paddled water craft, so here's what I've learned...for what it's worth. If you're up around the Yough, you probably wouldn't want a birch one anyway. Lots of patching after whitewater, but the advantage in the weight would give you less problems when you portage around the rapids instead, eh? The Old Town Saranacs are great, sturdy, durable, OK in light whitewater, and tough in calmer rivers when you hit a shallow spot with sharp rocks that you didn't expect. BUT they weigh a freakin' ton, AND they SRP is around $600-$700 before shipping, so outside of your price range. I couldn't own one as my camping-car's rack has a limit of 60 lbs. Might I suggest a bit more of an authentic boat, that is lighter? How about building a Pirogue ? Pronounce pee-row for those not familiar..., these are a basic kit with you adding additional plywood, AND you can simply expand the build if the suggested size is not good with your cargo carrying needs. OK you're going to use plywood, unless you get a really friendly sawmill near you to cut you a break on very thin boards, BUT hey it's still all wood, and a lot closer than ploly-whatever or aluminum, eh? A LOT CHEAPER TOO. Try www,unclejohns.com for a Pirogue plan if that is the way you go. They have several other plans as well. Good luck in your boating trek adventures. Sorry I had a bit of a time finding this company online...IF you want a lightweight wooden canoe, which is shaped like a canoe instead of a pirogue... Selway has plans for all sorts of boats including canoes with sort of "classic" ends from a solo 12' weighing in at 46 lbs. with a capacity of 475 lbs (in case you want to do the Nessmuk trek) on up to 17' with a cargo cap of 900 lbs. but it does way 96 lbs. I might suggest you look at the 15' 10" "Wren" which weighs in at 45 lbs. but gives you a cargo cap of 750 lbs. They weigh less and look much better than the Old Town. I guess I'm what you might call a "canoe nut". I currently have four of them, each for a different purpose. I have a 17' "laker" canoe, a 16' general purpose canoe (Woodstrip-made it myself), a 12' small stream canoe, and a 12' whitewater canoe. There are general purpose canoes that will serve in most situations. However, there are also many special purpose types. Consider the type of waters that you will be in most often. Also consider whether you will be going solo or have one or two companions with you. Small canoes make manuevering in small streams much easier. But smaller canoes generally do not "track" well. (That means they don't like to go in a straight line.) Big canoes handle big river or lake waves and motorboat wakes much better, and almost all of them are designed to track well over long distances, but they also have higher sides that catch the wind so you get blown off course more often on windy days. Big canoes are also better for duck hunting out of because gun recoil during broadside shots is less likely to cause you to roll over. The pirogue has a flat bottom and is a great little calm water swamp, small stream, and pond boat, but I would not want to take one down the rapids or out on a choppy lake. They are, however, cheap and easy to build yourself. You could also mount an electric trolling motor on the side of a canoe. I have found that such a motor with about 35 pounds of thrust can move my 17' canoe along about as fast as I can paddle it. Years ago, my Dad hung a tiny 1 1/2 h.p. gas outboard on the side of his canoe. It really made his canoe scoot along! A 16' general purpose canoe should not weigh more than 50-60 pounds. My little 12' canoe only weighs around 25-30 pounds. That is the main reason why I use it the most. I have carried my big 17' over portages up to 3 miles long, but that is hard work. Now I mostly use one or the other of my 12' canoes. I can get to some great, remote trout holes when I use my whitewater canoe. There are lots and lots of wooden canoe plans available. Just do a google search. You can also read all about the different designs. My friends need a bigger than average two man canoe as I have a Santa Claus physique. My doctor tells me I need to "get into shape", and I reply, "well ROUND is a shape!" It sounds like something about 15'-16' would serve you fine. If you expect to ride any whitewater, do not get a canoe that has a keel! Keels help with tracking, but they tend to catch on rocks in the rapids and that can cause a roll-over very quickly. Thanks to all for your input! Much appreciated! I have real 14' birch bark canoe, and have found its length to be perfect for my solo overnight treks and such. Have also had my wife and dogs in it as well on family outings and it does just fine on the lakes and calm rivers. The 14' length is just right for all the times I'm alone and have to paddle and portage it. It weighs in at just over 60 lbs. I know you said you really like the replica birch barks, but the price is just out of reach for you at the moment. If you ever get into the position some day to get one, I would suggest checking around for "used" bark canoes. I've seen several for sale which rival the prices one might pay for the fiberglass replicas. Some need just a little bit of work here and there to get them back up to 100%, but it beats the price for a brand new one. Will do.. I would love to have a real one! Way back in the olden days of 1965 a friend and I took a canoe voyage down the upper Delaware River from Port Jervis, NY, down to Lambertville, NJ. We were teenagers then. We put some stones in the canoe with the idea of bouncing them off a duck or two for our dinner. That never happened, but the stones did come in handy one time. Some jerk kid in a motorboat came along to harass us. He ran his outboard in circles around us, throwing up a wake that caused our canoe to rock and roll. Yelling at him to go away did not help. However, when I bounced a rock off his outboard he got the idea and left us alone. I do a lot of time in a canoe all summer..New canoes can take punishment where as a real bark can not.The idea of real is good but the facts make new materials a better choice in some cases.Lot of upkeep in a real canoe. You didn't mention if you would be solo or with someone else. Off hand, the Old Town Saranac looks like it would meet your needs. The 80 pounds is a little more than some models but in a lake it doesn't matter. The length seems about right and the hull able to withstand the occasional rock. A seat in the middle would be good if you are solo. Would be solo most of the time. but would take the wife and daughter some also. Have not purchased yet, got so busy working the year went by quick. Have been really looking at the X-13 sportspal model. Looks like it would be a good stable one when the family is with me. I have been using my little 12' lately on the Tennessee River. From the landing I paddle upsteam about a half mile to a big slough where I have been hunting. While on the open river I stay near the shore because the big boat traffic could easily spell my doom. Besides the big cabin cruisers and houseboats, there is the occasional towboat and string of large barges. They can throw up a wake 4 feet high! Once I get to the swampy backwaters, then my canoe is the proper boat to have in there. An Oldtown tripper is the best canoe for hauling gear for camping on a canoe trip. They don't paddle the best empty. We have a publication in Maine called Uncle Henry's out of Augusta and a lot of canoes are sold in it. You can see what different canoes are going for. I like aluminum except for river trips and then I use my White with a royalex hul to slip off rocks.